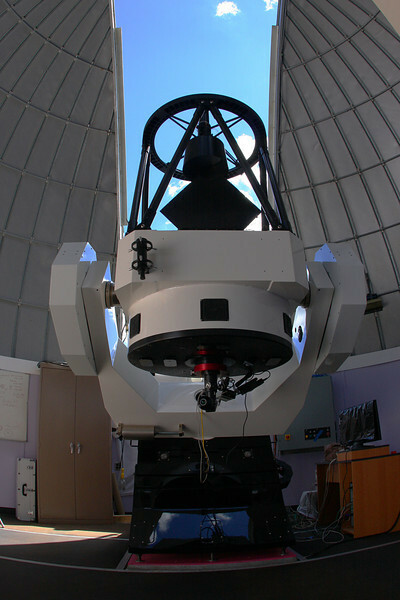 32 inch Schulman Foundation telescope (generally known as the Schulman Telescope) on Mt. Lemmon with dome open, prepared for visual observing, on September 18, 2010. The precise polar alignment, final testing to conform to specificatons. and other steps needed for astrophotography including installation of the camera were subsequently performed. Computer and monitor to control telescope during astrophotography, and internet connectivity have also been put in place permitting worldwide access by amateurs and professionals. This 32 inch telescope replaced the 24 inch R-C used to obtain the raw frames processed into some of the images on this web site.